The potential for biomass with CCS and direct air capture of CO2 should not distract from deployment of CCS on fossil fuel plants over the next few decades. Among other things, learning from CCS on fossil fuels will help make eventual deployment of CCS on biomass cheaper and more effective. There appears to be increasing likelihood that atmospheric concentrations of greenhouse gases will grow to exceed levels consistent with the target specified in the recent UNFCCC Paris agreement of limiting temperature rises to “well below” two degrees. Such an outcome would require CO2 to be removed from the atmosphere faster than natural sinks allow, in order to restore concentrations to safe levels. Near zero net emissions in the latter part of this century will also be needed to stabilise concentrations. Many models of future emissions pathways now show negative emissions technologies (technologies that result in a net decrease in CO2 in the atmosphere) needing to play a major role for in meeting climate goals. They have the potential to remove carbon dioxide from the atmosphere in the event of “overshoot” of target atmospheric concentrations, and to balance remaining emissions from sectors where abatement is difficult with a view to achieving net total emissions of close to zero. But the application of such technologies should not be considered in isolation. However at an energy system level, where the CO2 is captured – biomass plant or fossil fuel plant – is less relevant than the total amount that’s captured. Broadly speaking, if there is a biomass plant and fossil fuel plant both running unabated the same benefit can be achieved by capturing a tonne of CO2 from either. Indeed there may be advantages to putting CCS on a conventional plant rather than biomass plant. It may be technically more tractable. Furthermore, CCS require a lot of energy to capture the CO2 and then to compress and pump it for permanent storage. Biomass is likely to be supply constrained (again, this is an issue that requires a post in itself), so using biomass rather than fossil fuels to provide this energy may limit other applications. Only when there are no fossil fuel plants from which to capture CO2 does biomass plant become unambiguously a priority for CCS. This is clearly some way off. Furthermore biomass with CCS for electricity generation may not be the best use of bioenergy. Converting sunlight to bioenergy then turning that into electricity is a very inefficient process. Typically only 1-2% of the sunlight falling on an area of cropland ends up as useful chemical energy in the form of biofuels. There are various reasons for this, not least of which is that photosynthesis is a highly inefficient process. Burning biomass to make electricity adds a further layer of inefficiency, with only perhaps a third or less of the energy in the biomass turned into electricity. Sunlight therefore gets converted to electricity with an efficiency of perhaps 0.5%. This compares with around 15- 20% for solar cells, implying that scarce land is often likely to be best used for solar PV. (The calculation is closer if solar PV is used to create storable energy e.g. in the form of hydrogen). For similar reasons the use of biofuels rather than electricity in transport is inefficient, in part because internal combustion engines are less efficient than electric motors. Limited available biomass may be better used for those applications where it is the only available lower carbon energy source, notably in aviation and (likely) heavy trucks, or for other applications such as district heating with CCS, where the ability to store energy seasonally is especially valuable. At the very least, detailed system modelling will be required to determine the optimal use of biomass. Suggesting that BECCS should have a major role to play simply because in isolation it has negative emissions may lead to suboptimal choices. Direct Air Capture (DAC), where carbon dioxide is chemically absorbed from the atmosphere and permanently sequestered, can also reduce the stock of CO2 in the atmosphere. However the typical concentration of CO2 in a flue gas of a power plant or industrial plant is several percent, about a hundred times as great as the concentration of 0.04% (400 ppm) found in the atmosphere. This makes the capture much easier. Furthermore, millions of tonnes can be captured and piped from a single compact site using CCS, generating economies of scale on transport and storage. In contrast DAC technology tends to be more diffuse. These considerations imply that CCS from power plants and industrial facilities is always likely to be preferable to direct air capture until almost all the opportunities for CCS have been implemented, which again is a very long way off. There are many uncertainties around negative emissions technologies, including the availability of biomass, cost, and the feasibility of reducing emissions in other sectors. For these reasons developing optionality remains valuable, and research to continue to develop these options, including early trial deployment, is needed, as others have argued[i]. One of the best ways of developing optionality is to deploy CCS at scale on fossil fuel plants. This will reduce the costs and enable the development of improved technologies through learning on projects. It will also help build infrastructure which can in turn benefit BECCS. This needs to run in parallel with ensuring that the lifecycle emissions from the bioenergy production chain are reduced and biodiversity is safeguarded. Negative emissions technologies may well have a role to play in the latter part of the century. But they seem likely to make more sense when the economy is already largely decarbonised. In the meantime deployment of CCS, whether on industrial facilities or power plants, needs to be a much greater priority. This entry was posted in bioenergy, CCS, Climate change policy, power generation and tagged BECCS, bioenergy, CCS, CCS deployment, climate change, climate change policy, DAC, decarbonisation, energy technology, power generation on 21/03/2016 by adamwhitmore. There is now sufficient experience of CCS around the world to begin to see what makes early projects happen. Most projects capture from natural gas processing or other industrial processes, with little progress in the power sector. 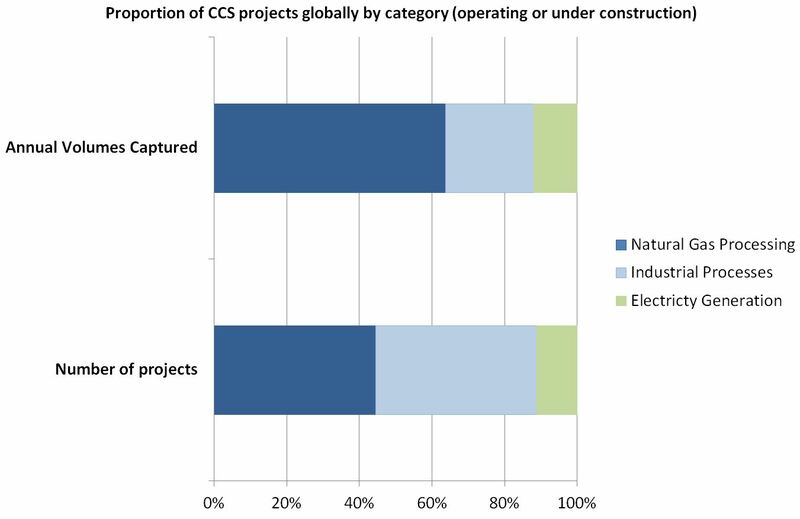 Many projections show CCS as a major future contributor to decarbonisation. But, as described in my last post, energy technologies take a long time to reach scale, and CCS has to date developed less rapidly than many were hoping a few years ago. However with around eighteen large-scale projects now either operational or under construction patterns have begun to emerge that indicate which factors make for a successful project [i]. Use of captured CO2 for Enhanced Oil Recovery (EOR) is common across projects of various types, being a feature of two thirds of projects. When injected into oil reservoirs each tonne of CO2 can enable the production of (typically) two or three additional barrels of oil, making the CO2 a valuable commodity rather than a waste product. While the carbon capture project is unlikely to be able to capture all of this value (much of it flowing to the owner of the oil field), the revenue can be substantial. For example, the price paid for CO2 in some Canadian projects is understood to be $60/tonne or more. This greatly enhances the economics of a project relative to incurring a cost for transport and storage, which in the absence of oil revenue is likely to be at least $20/tonne. The most widespread application of CCS technology to date, with eight projects out of the eighteen and over 60% of annual volume captured, has been for natural gas processing, where CO2 needs to be removed to meet the specifications required by the pipeline network. There is a wide range of projects, including onshore processing where the CO2 is used for EOR, such as at the Val Verde project in the USA, offshore processing where CO2 is injected into saline formations, for example the Sleipner and Snohvit projects in the Norwegian North Sea, and the Gorgon project under construction in Australia, where CO2 will be captured from a LNG liquefaction facility. However the contribution of CCS to decarbonising the power sector and other combustion remains minimal. There are only two full-scale (greater than 100MW capacity) power projects under construction. The largest of these, the Kemper County project in Mississippi, has relatively high emissions (estimated to be greater than those of a CCGT per MWh) due to its use of lignite and a relatively low capture rate. The other is the Boundary Dam project in Saskatchewan where construction is nearing completion and commissioning is due to start later this year. Whichever of the CCS technologies a power project uses – pre-combustion, post-combustion or oxyfuel – a chemicals plant needs to be added to the power plant, and this is inevitably expensive. The large additional capital and operating expenditures required for a capture system, combined with the loss of efficiency due to the energy required to run the capture process, including the electricity required to compress the CO2 ready for transport, add greatly to the cost of power. According to a recent study sponsored by the UK government, power generation with CCS has a cost of around £161/MWh at present, about three times the cost of power from conventional fossil fuels [ii]. The study suggests that this could potentially be reduced to around £100/MWh by the early 2020s, although this may prove a somewhat optimistic estimate. Meanwhile, the Kemper County plant is reportedly suffering cost over-runs. Thanks to Dave Mirkin of 2CO for providing valuable input for this post. To follow this blog click on the Follow button in the bottom right of the screen. [i] See the 2012 Annual Report from the GCCSI and January update. http://cdn.globalccsinstitute.com/sites/default/files/publications/85741/global-status-ccs-january-2013-update.pdf I have added the Abu Dhabi ESI project to the total as I understand it has now progressed to the construction phase. A similar project is understood to be planned in Saudi Arabia, but is excluded due to lack of firm information. This entry was posted in Climate change policy, power generation, Uncategorized and tagged CCS, CCS deployment, climate change policy, decarbonisation, power generation on 03/06/2013 by adamwhitmore.